Blowout Sale! Save 51% on the EasyR Pour Over Coffee Maker – The Carafe Brews Superior Tasting Coffee Without Waste, Includes Reusable Stainless Steel Filter, Glass Lid and Free Neoprene Pot Sleeve Warmer to Keep Coffee Hot – 14floz by EasyR Home at Rat Coffee Shop. Hurry! Limited time offer. Offer valid only while supplies last. Are you ready for delicious coffee that makes regular drip coffee seem tasteless? Then you need to get the EasyR Home single server coffee brewer. Are you ready for delicious coffee that makes regular drip coffee seem tasteless? Then you need to get the EasyR Home single server coffee brewer. This simple, non-electric coffee maker extracts the deeper flavors from your coffee grounds and is a must-have for any coffee lover. Simply fill the reusable cone-shaped stainless steel filter with fresh medium-ground coffee and place in the carafe. Heat water to nearly boiling, and slowly pour into filter, allowing the water to become infused with the coffee flavor until the rich brew fills the carafe below. Use the heatproof silicone handle on the filter to safely remove the filter and dispose of the grounds. Place the glass lid on top to keep coffee hot. 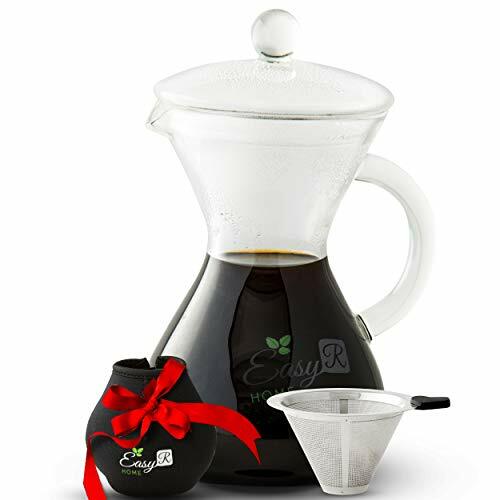 The carafe holds up to 14 ounces of delicious coffee and can also be used for other hot or cold beverages, including hot tea, iced coffee, iced tea and fruit-infused water. The neoprene cover warmer and the fitted glass lid work together to keep your beverage at the ideal temperature, whether hot or cold. The EasyR Home single mug coffee maker's simple and elegant design eliminates waste. There is no need to make a whole pot of coffee when you can make a single cup of flavorful coffee with no fuss. It is also eco-friendly. There are no plastic cups to throw away like with a K-cup machine, and the paperless filter that is included can be reused over and over again. Made from extra strong borosilicate 3 mm glass, the EasyR coffee brewer will stand up to hundreds of uses. The neoprene cover offers additional protection from breakage and protects you from the hot liquid. Use it at home when you cozy up to read or watch TV, or pack it with you on a camping trip. It uses no electricity, just manual processes, to produce a rich, satisfying cup of coffee. The EasyR Home pour over coffee system is packaged in an attractive gift box and makes a great gift for the coffee lovers in your life. Add it to your cart now and enjoy! If you have any questions about this product by EasyR Home, contact us by completing and submitting the form below. If you are looking for a specif part number, please include it with your message.